Outdoor sports and physical activity bring joy and good health to our bodies and minds. Smart choices can be made to protect the skin from harm, while still allowing us to enjoy and embrace outdoor activity. Choose tops that cover the shoulders and upper back. Wear a swim shirt, also known as a rash guard shirt, when you go to the pool. Choose a hat with a 3″ (or wider) brim that blocks sunlight. When shopping for a hat, hold it up in front of your face, and see if you can see light through the brim. If you can, then that brim is not going to protect your face and ears fully from the sun. Choose your time in the sun wisely. Avoid sun exposure between the hours of 10 a.m. and 3 p.m. Enjoy a morning or evening swim, instead of midday sunbathing. Sit under a patio umbrella or a shade tree, rather than directly in the sun. Peeling or exfoliating – Chemical peels, exfoliating skin care products, and lightening creams all remove the stratum corneum (layer of keratin that overlies and protects the skin). They all make the skin more susceptible to sun damage and long-term discoloration. Pregnancy – Burns and sun-related discoloration may be surprisingly severe during pregnancy. Therapies – Some medications and therapies may make you “photosensitive.” Check labels and remember to ask about this. 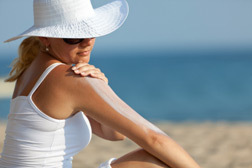 Extra precautions may be necessary to protect your skin from sun damage and long-term discoloration. Read also some helpful tips on prevention.